This morning I sat through one of those truly annoying on line infomercials, the ones where you don't know how long your going to be suckered in while you wait to find out the cost of this once in a lifetime miracle. Anyway, this one was selling, er, offering me the rare opportunity to purchase, a water ionizer to insure that all of Lifes liquid elixir that one drinks is at a ph of 9.5. They made a great case about the benefits of drinking super alkaline, antioxidant rich, and ultra hydrating ionized water and they had me vowing that I was going to pay even closer attention to every sacred drop of water that enters this wet body, with or without their oh so surprisingly inexpensive machine. Well $2,400 won't be flyin' out the door just yet ( lemons , limes , veggie juices n quality salts will do fine for now) .... but THIS was the line in the ad that made me all huffy n puffy (not a good thing for a breathworker!). Quoting Dr. Robert Young, it said " The aging and dying process is largely the process of dehydration and, in my 25 years of studying nutrition, I have found nothing that a person can do that is more important to his or her health than change the kind of water they drink" noting that "all the good food you eat can't make up for the bad water you might drink." Excellent point, dear doctor, but I must clearly raise you one on your assessment of our human condition. 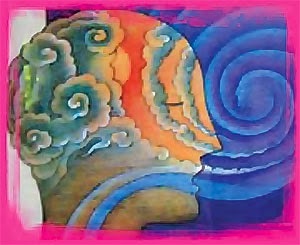 Truly, the element most vital and immediate for our well being is the air we breathe...and the way we breathe it. All the good water you drink can't make up for a closed and suppressed breath. On average we breathe about 20,000 each day and when we can improve on each breath, even a little, the benefits can be enormous. From birth up to this very moments , we are our breath and our breath tells us how we are. However, with life's many traumas, both great and minor, our breath typically becomes limited and restricted, and our lives follow suit. The great news is that we are humans (c'mon, it is a blessing!) and , though we hold these limitations and wounds in our bodies more than other species, we also have the capacity to consciously relearn how to have a free and open breath, easily and with no money down. And no amount of water, no matter the ph, serves as a greater guide offering wisdom, guidance, and release than our own most sacred breath.